The Isle of Dogs, is a geographic area of London made up of Millwall, Cubitt Town, Canary Wharf and parts of Blackwall, Limehouse and Poplar. It is locally called the island, It is in the East End of London and is bounded on three sides (east, south and west) by a large meander in the River Thames. The northern boundary has never been clearly defined but many people accept it to be the (former) line of the West India South Dock. The name Isle of Dogs had no official status until 1987, when Tower Hamlets London Borough Council created the Isle of Dogs Neighbourhood. 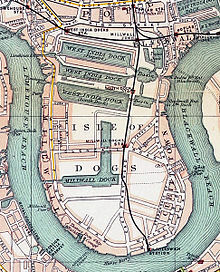 ↑ "The Isle of Dogs History - Learn About East London". 28 March 2014.